Explore some of Tasmania's spectacular east coast scenery, including the Freycinet Peninsula and Maria Island, by foot and sea. 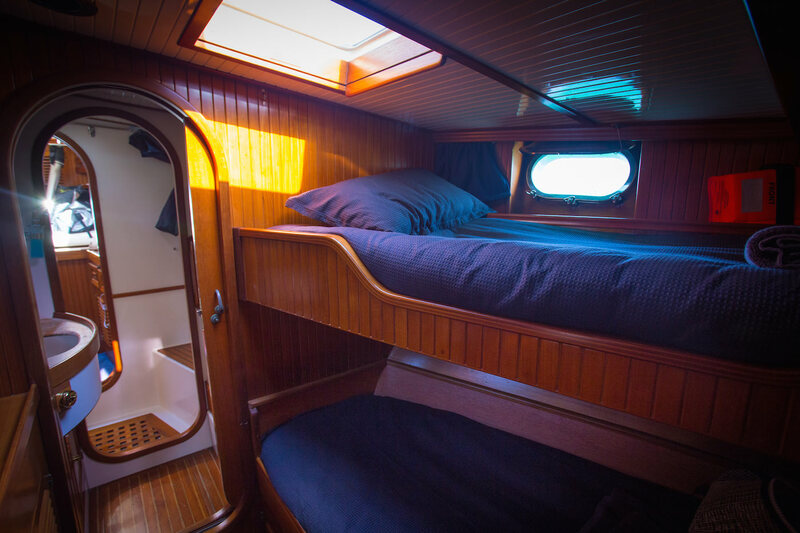 Travel is on board the luxurious 21 metre (75 foot) ketch rigged yacht, Lady Eugenie. Sail from one stunning walking destination to the next where the choice is yours to immerse yourself in the spectacular coastal scenery, mountain views and heathlands, or stay on board the yacht to relax, explore the beach, snorkel, swim or kayak at your leisure. 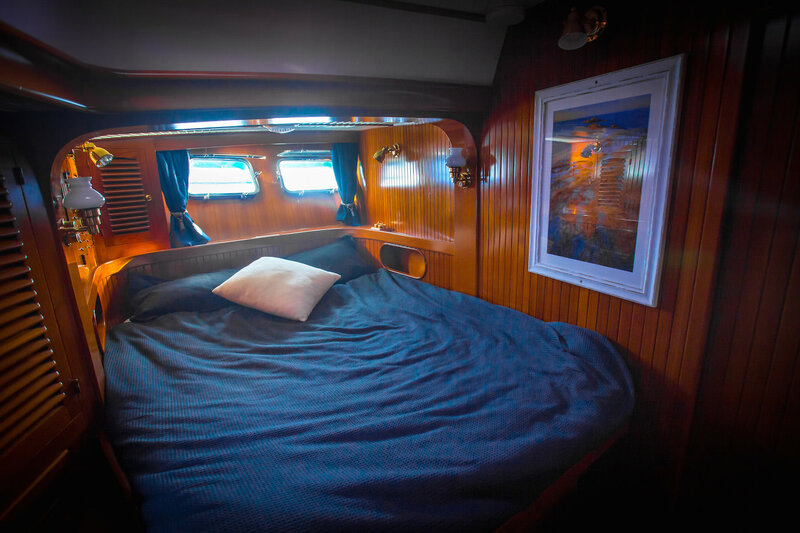 Retire each night to the relaxed sophistication of Lady Eugenie where your guides will prepare a delicious dinner served with a selection of Tasmanian wine; or enjoy a barefoot beach dinner under the stars. 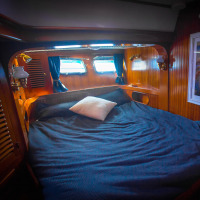 Lady Eugenie is a luxurious, 23 metre (75ft) ketch rigged yacht, offering 5 comfortable cabins (2 double, 2 twin), all with air conditioning and en suite bathrooms with showers. The beautifully maintained teak decks are the perfect setting to relax and soak up Tasmania's stunning East Coast scenery. The central cockpit offers plenty of comfortable seating as well as an al fresco dining setting. 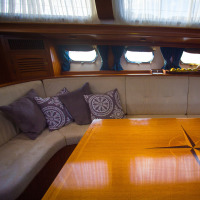 The spacious saloon with dining table and lounge is a delightful place to relax in the evening. Please note, we will do our best to provide you with your preferred room type, however cabins are allocated on a first come, first served basis at the time of booking. Trips depart regularly from September to the end of May, with a minimum group of 4. Please contact us for available departure dates. Meet your guides and fellow guests at 7.30am at Salamanca Inn in Hobart. 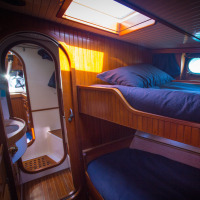 After introductions and gear check, travel by bus to the fishing port town of Triabunna where we board our 23 metre (75ft) luxury ketch Lady Eugenie. A short morning sail takes us across the Mercury passage to Maria Island and the World Heritage listed convict site of Darlington. Once populated with prisoners, it is now home to an array of architectural relics and abundant wildlife. From here we begin the ascent of Bishop & Clerk (630m), traversing the high cliff edge of Fossil Bay, where we are afforded sweeping views toward Schouten Island and the Freycinet Peninsula. Enjoy a packed lunch perched high atop the dolerite columns of the summit. Alternatively, there is the more relaxed option of visiting the beautiful sandstone patterns and structures of the Painted Cliffs, as well as the opportunity to learn more about the islands unique Aboriginal, convict and industrial histories whilst rambling around the Darlington precinct. In the late afternoon, we retire to the comfort of our luxury yacht for pre-dinner nibbles and a delicious meal. After a leisurely breakfast on board Lady Eugenie we set sail, departing Maria Island and heading north toward Schouten Passage. Sailing past the large sedimentary deposits of Fossil Bay and the towering dolerite columns of Bishop & Clerk, this 4 hour journey takes us toward the stunning pink granite boulders and mountains of the Freycinet Peninsula. We disembark on Schouten Island where there is the option of a scenic 3 hour walk to the top of Bear Hill. Alternatively we may enjoy a more leisurely afternoon, relaxing on-board or on the beach, snorkelling or swimming. Tonight, enjoy a luxury barefoot beach dinner on the secluded shores of Schouten Island. This morning over breakfast, we will decide whether we ascend Mt Graham and take the high route to Wineglass Bay, or opt for the less challenging but equally stunning coastal section of the Freycinet Peninsula circuit track. The former sees us head inland from the shores of Cooks Beach and ascend through tall Tasmanian Blue Gum forests before traversing the button grass fields of the East Freycinet Saddle, dotted with seasonal wild flowers. The trail descending from Mt Graham and Mt Freycinet takes in spectacular coastal views including the iconic Wineglass Bay. The coastal track heads north from Cooks Beach following the shore of Promise Bay while The Hazards mountain range gradually unfolds before us to dominate the northern vistas over the peninsula’s isthmus. An hours walk along Hazards Beach will bring us to the Isthmus Track which provides the opportunity for a close up view of the wildlife at the lagoon before setting foot on the white sands of Wineglass Bay. After completing either of these walks there is time for a refreshing swim before boarding Lady Eugenie. After bidding our skipper farewell, we pack all of our belongings into the 50-litre pack provided and take a short walk along the shores of Wineglass Bay. We then ascend between pink granite boulders and enjoy our lunch overlooking the white sand and turquoise water of the beautiful Wineglass Bay below. A steep descent then brings us to our bus which will take us back to Hobart , stopping at a Coal River Valley vineyard en route for canapés and celebratory drinks. We will arrive back at the Salamanca Inn at approximately 6pm, after an airport drop off at 5.30pm. Meet your guides and fellow guests at the Salamanca Inn in Hobart at 7.30am. After introductions and gear check, travel by bus to the fishing port of Pirates Bay on the Tasman Peninsula. Our journey begins at the Waterfall Bay lookout, walking along spectacular cliff tops before traversing through stunning cloud forest and rainforest, featuring wonderful coastal views, waterfalls and rocky outcrops. 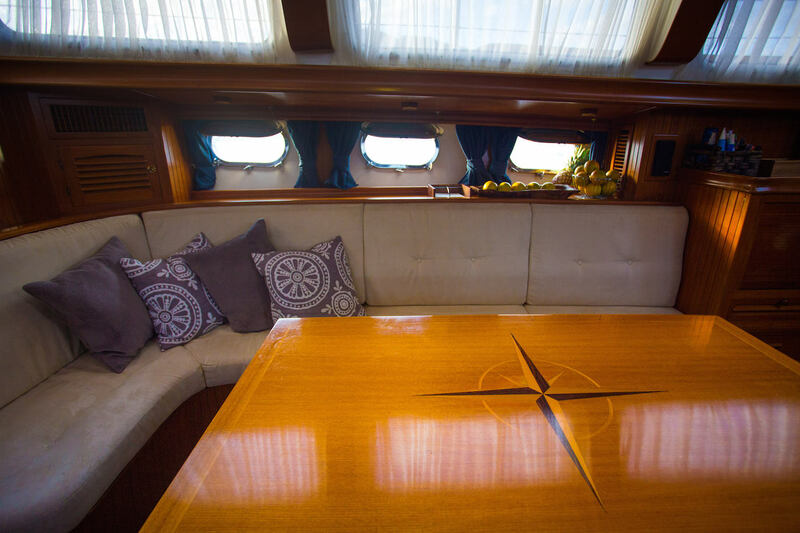 After arriving at Bivouac Bay, we transfer via dinghy to our 23m (75 foot) luxury ketch Lady Eugenie where we will enjoy a glass of wine and pre-dinner nibbles whilst taking in panoramic views of the dramatic cliffs of Cape Hauy. Our first night is spent in the tranquil shelter of Fortescue Bay, with a gourmet dinner prepared by your guides. After the boat delivers us to the shores of Fortescue Bay, we may choose to relax and swim at the beach, or take an optional 4-hour return walk to Cape Hauy. The walk gently ascends a well made track to the top of the sheer dolerite cliffs for which the Tasman Peninsula is famous. The walk offers sweeping views of dramatic rock formations, such as the Totem Pole and the Candlestick. Return to Lady Eugenie for lunch before we set sail toward North Bay. This slow-cruising journey will take up to 3 hours, sailing past Cape Frederick Henry and Cape Surville, Sisters Rocks and Deep Glen Bluff. A relaxing end to the day with an afternoon of beach rambling, swimming or bird watching. The night is spent anchored off the coast of the Forestier Peninsula. This morning we sail past Marion Bay, Cape Bernier and the south end of Maria Island to the World Heritage listed site of Darlington, now home to an array of architectural relics and abundant wildlife. Return transfers between Hobart and the start of the experience. All accommodation is twin share. Single travellers may be required to share a room with someone of the same gender. To guarantee a single room for the duration of the walk, a supplementary price of 75% of the full fee will apply. Tours operate between 1 September and 30 May. As long as you exercise regularly and have moderate fitness, you should enjoy this walking holiday. You need to be capable of walking between 9 and 14 km each day, including walking along beaches, some hill climbs and some uneven terrain. There is plenty of time to explore, as well as sit and rest, each day. There are also alternative options, should you wish to stay on the boat or choose a more relaxed walking alternative.